Well, technically, it's human heart tissue, but it beats all on its own. In Pennsylvania, tissue cells from a human were grown on the "scaffolding" on a mouse's heart, which sounds insane, but actually worked. After twenty days of growing and receiving blood, the tissue started beating away. They're hoping that the lab-grown tissue can eventually be used to replace parts of human hearts that have gone awry. Cardiovascular disease causes 17 million deaths each year, so a viable alternative would be pretty much the best thing ever. In Australia, they went about growing cartilage using the same model — applying human stem cells to a "scaffolding" and letting it grow — but this time, said "scaffolding" was model-cartilage created by a 3-D printer. The stem cells then grew into cartilage, which researchers are hoping could ultimately lead to self-healing cartilage. In Boston, a full human ear was created by taking animal tissue from cows and sheep, and then growing it on an "ear scaffolding" atop a rat. It sort of looks like a fish, but we'll save you the photographic evidence. The researchers are hoping to start testing on humans in the next few years. Their dream is to eventually grow ears on humans who have malformed ones, or have lost their own. 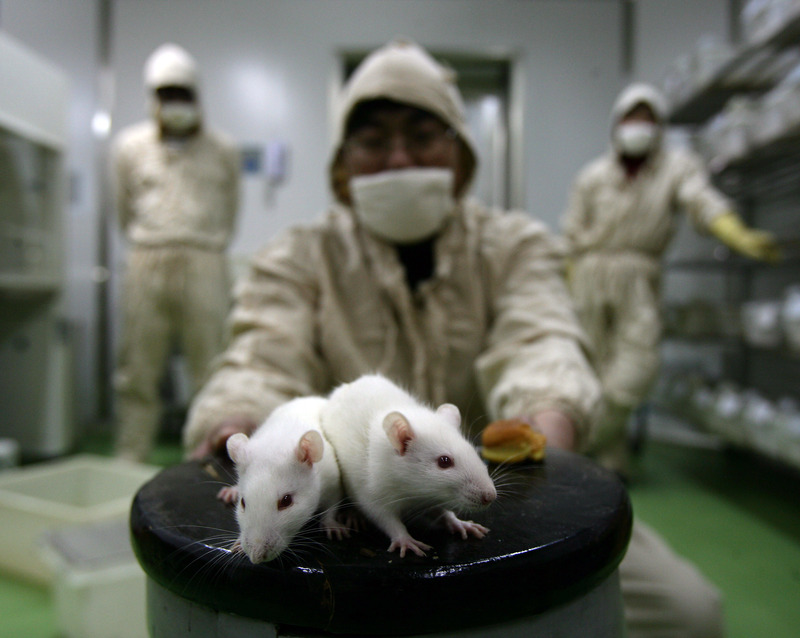 Lab-grown retinas, which have cured blindness in rats. Over in the U.K., it looks like the retinas could one day be lab-grown, and then implanted in human eyes to give the blind their sight back. It's an ambitious project, but early mice trials saw some success. Stem cells were (you guessed it) turned into tiny retinas, and injected into the eyes of blind mice. Only about 1,000 of 200,000 implantations worked, but when they eye accepted the new retina, it started working as normal to restore sight. The study's researchers called it a "significant breakthrough" towards curing blindness. A lab-grown hamburger patty that cost $300,000 to make was unveiled in London Monday, at a press conference dedicated to said burger. A Netherlands scientist had spent two years painstakingly growing it, so we can't imagine how he felt when two culinary experts just went ahead and ate it. The creation was largely funded by Google co-founder and Google Glass creator Sergey Brin. He's hoping that lab-grown burgers will be "transformative," and can lessen the damaging effects of the meat industry — for example, cut down on the huge amount of greenhouse gas emissions courtesy of meat-creating. This one came as a surprise to the Japanese scientists involved, which we're not sure is good sign. They'd mixed together three different kind of human cells — two from stem cells, and one from the umbilical cord — and were "gobsmacked" when they all curled up and formed a tiny liver bud. Said human liver bud was then transplanted into a mouse. The little liver got involved right away, hooking up to the bloodstream and performing as, you know, livers do. Researchers have their hopes pinned on making tiny "liver buds" for humans, built using that exact human's own cells. Like an embryo, the liver would then grow in humans to become a healthy, new liver. In a breakthrough that could end the shortage of quality players in the English Premier League, scientists at Maastricht University revealed the world’s first synthetic footballer yesterday. Taking stem cells from two short planks they have turned them into strips of dense muscle, which when inflated with vanity becomes a fully formed midfielder. OK. That one's a satire. But could be something to work on.